There are so many events and concerts in December that a selection of one-time only events are listed first, followed by a list of links to venues with multiple holiday shows and programs, then a list of ongoing monthly events. Also, the monster surfing waves at Jaws may be happening, when there are high north shore swells. Thursday, December 1, 5pm – 8 pm. Hui Holidays: First Night Celebration. 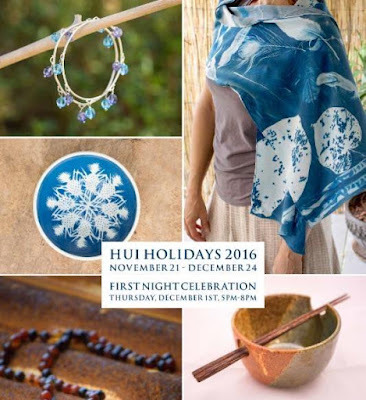 The grand opening of holiday shopping at the Hui No’eau, replete with music, drinks, and pupus. $30. Hui No’eau Visual Arts Center, Makawao. Thursday, December 1, 5pm – 8 pm. 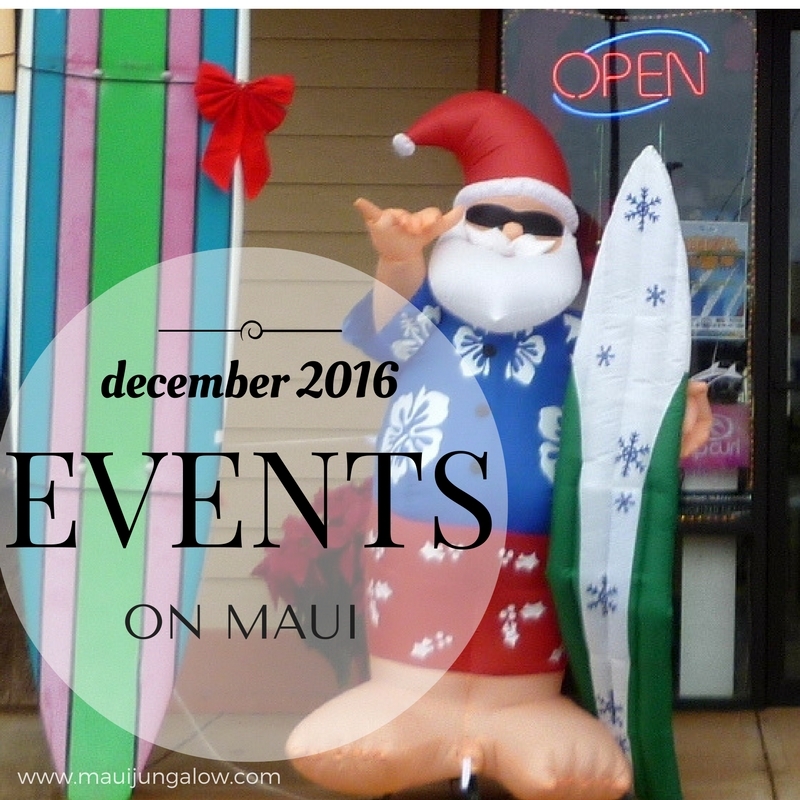 Maui Ocean Center Holiday Shopping & Charity Event. Admission includes access to aquarium exhibits and dive presentations, live music, shopping from local vendors, door prizes, and photos with Santa. Maui Ocean Center, Maalaea. $5 + donation of 2 food items to the Maui Food Bank, or $7 full price. Thursday, December 1 - December 3. BMI Maui Songwriters Festival. Intimate shows and energizing concerts by songwriters sharing songs and the stories behind them. Locations and admission prices vary. Friday, December 2, 5:30 pm – 9 pm. Holiday Appetizers That Wow. New ideas and twists on holiday appetizers. A cooking class with Chef Lee. Sugar Beach Events. $95. 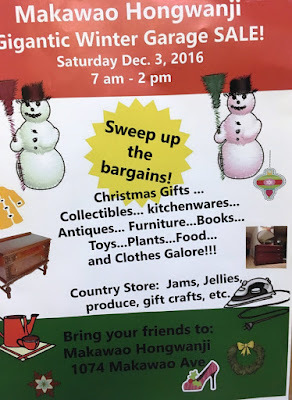 Saturday, December 3, 9 am – 3 pm. Project Gift. 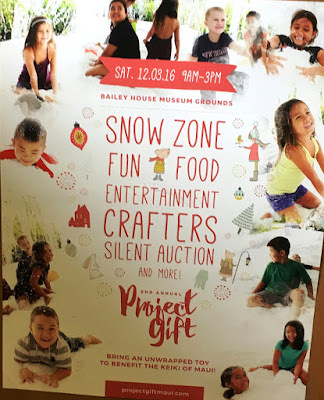 The goal of this event is to give every child on Maui a gift for Christmas, especially those who are homeless or hospitalized. Celebrate the day with a holiday fair, silent auction, entertainment, and keiki zone at the Bailey House Museum, Wailuku. No admission fee - please bring a new, unwrapped gift for a child, age 0 to 17. Saturday, December 3, 10 am – noon. Cooking with Ulu with John Cadman of Pono Pies. Learn how to cook ulu (breadfruit) including how to select fruit, handle, and use various methods. Maui Nui Botanical Gardens, Kahului. $25/members, $50 nonmembers (includes one year membership). Saturday, December 3, 1 pm – 4 pm. Lei of Aloha 10. Open house and benefit for Pau O Hiiaka, with music, hula performances, historic tour, poetry reading, and light refreshments. $30. Wailuku Inn, Wailuku. 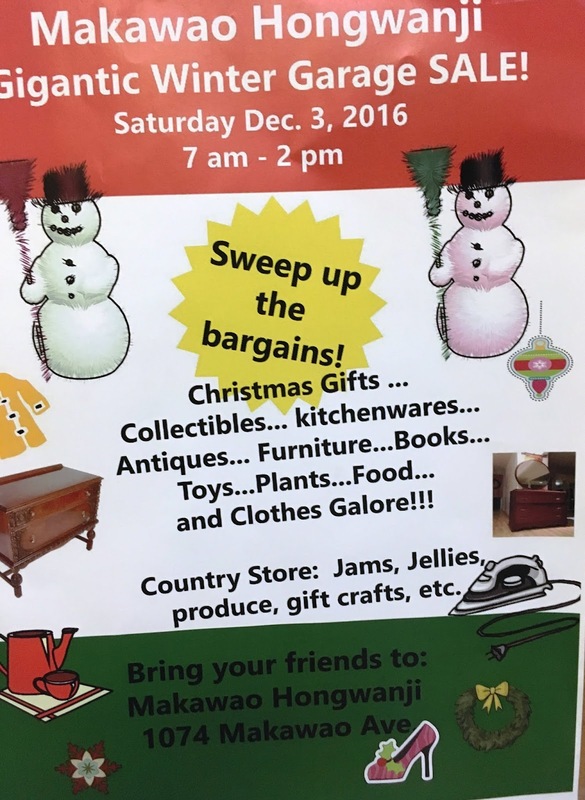 Saturday, December 3, 9 am – 4 pm. Haleakala Waldorf School Holiday Faire. 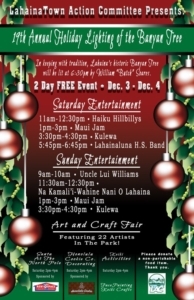 The premiere holiday craft show on Maui with keiki activities, wreath booths, crafters, food booths, and entertainment. Free prize to children dressed as elves for the 10 am elf parade. Haleakala Waldorf School, Kula. Saturday, December 3 and Sunday, December 4. 8 am – 3 pm. Maui Bird Conservation Center’s Open House. Once a year, the MBCC offers public, guided tours of their facility to breed and release endangered Hawaiian birds. Reserve your tour in advance by calling 808-572-0690. Makawao. FREE! Saturday, December 3, 7 am – 2 pm. Makawao Hongwanji Winter Garage Sale. Makawao Hongwanji, 1074 Makawao Avenue, Makawao. Saturday, December 3, 9 am – 7 pm and Sunday, December 4, 9 am – 5 pm. Holiday Lighting of the Banyan Tree. Craft fair with holiday activities: cookie decorating, face painting, music, Banyan snowman, and holiday lighting of the banyan tree at 6:30 pm on Saturday. Banyan Tree Park, Lahaina. FREE! Saturday, December 3, 7 pm. The Merwin Conservancy Presents William Finnegan in the Green Room. MACC, Wailuku. $25. $10/students. 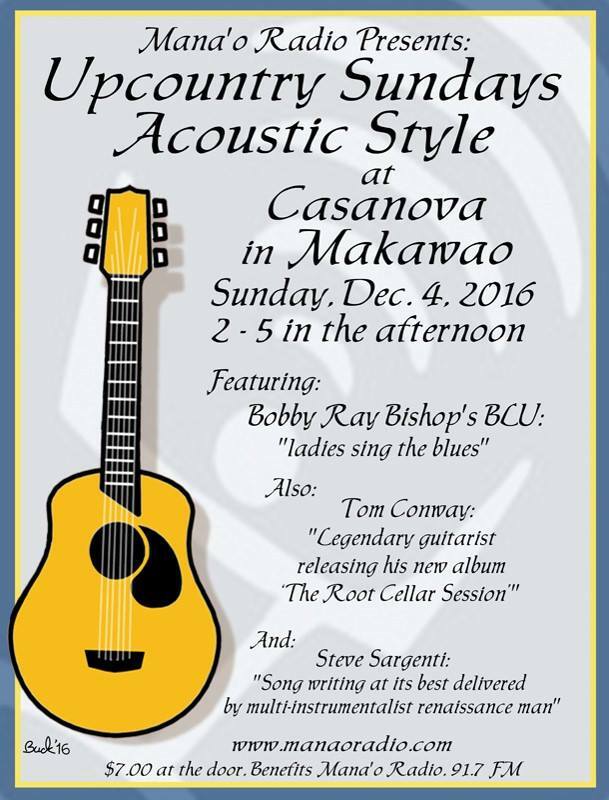 Sunday, December 4, 1 pm – 6 pm. Yuletide MarketFair supporting Imua Family Services. A hip craft fair that includes locally made beer. Maui Brewing Co., Kihei. Donation requested (amount unknown). 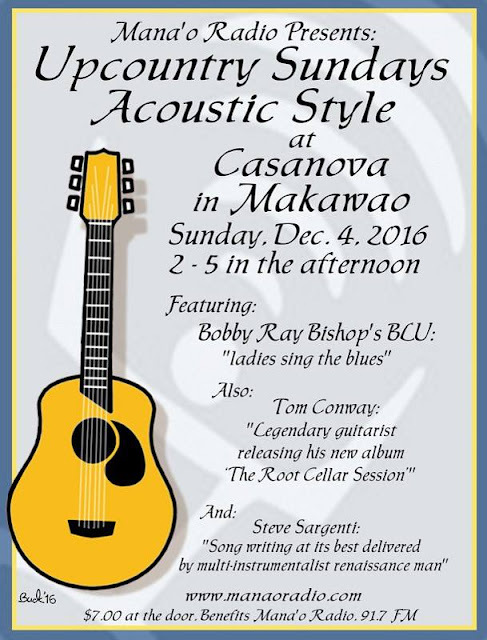 Sunday, December 4, 5 pm – 8 pm. Tree Lighting Ceremony. 8 miles of white lights will be strung along the resort and on a live Christmas tree, with a concert to follow. Grand Wailea Resort. Saturday, December 10, 12 noon – 9 pm. Maui Music Tech Day. Network with musicians, capitalists, and techies. Royal Lahaina Resort. $30. Saturday, December 10, 9 pm – 1 am. Jimi Hendrix Birthday Bash. 60s costume party with 30 of Maui’s blues rock musicians. Three’s Bar and Grill, Kihei. $20-$25. Sunday, December 11, 12 noon – 6 pm. Pottery & Jewelry Sale. Handmade art and benefit for Maui Food Bank. Lumeria Lobby, Makawao. Sunday, December 11, 9 am – 2 pm. Maui Mompreneur Winter Craft Fair. Support Maui mom-owned businesses. Maui Beach Hotel, Elleair Ballroom, Kahului. Free. Sunday, December 11, 10 am – evening. 10 Year Anniversary of the Sacred Garden. Open house all day and an evening labyrinth walk. Kaluanui Road, Makawao. Tuesday, December 15, 6 pm – 8 pm. Mokuula by Moonlight. As the full moon rises, enjoy live music, storytelling and sharing. Kamehameha Iki Park, 525 Front Street, Lahaina. Free. Thursday, December 15, 7 pm – 8 pm. Sugarcane Days. Maui writer Jill Engledow shares some of her research gleaned at Hawaii Commercial & Sugar Plantation. Wailuku Public Library. Free. Saturday, December 17, time TBA. 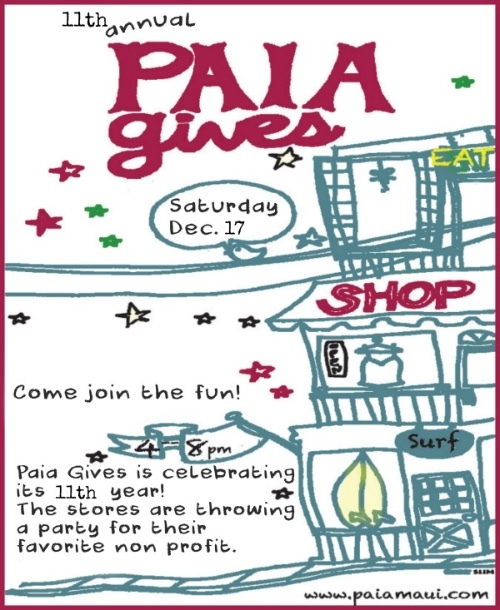 Paia Gives. Special shopping night in Paia with giveaways and festivities, during which participating merchants give a portion of sales to charity. Details are still being planned. 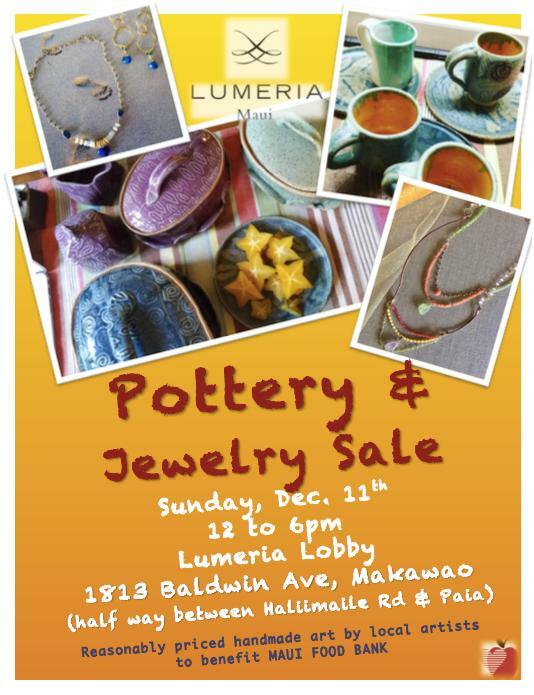 More info to be posted at www.paiamaui.com. Saturday, December 17, 9 am – 11 am. Santa Arrival By Outrigger Canoe. Grand Wailea. Open to the public. Free! Saturday, December 17, 4 pm. Maui Santa Rampage. First annual Santa bomb Maui (like a photo bomb) beach bar crawl. Dress in a Santa outfit. Charlie Young Beach, Kihei, then will move to various locations. Wednesday, December 28, 5:30 pm. Japanese New Year Traditions and Dinner, by the Japanese Cultural Society of Maui. Try your hand at pounding rice mochi, sample different mochi sweets, and enjoy a bento dinner. Wailuku Hongwanji. $10/members, $15/nonmembers. Also, check out Merry Maui Christmas on Facebook for more holiday updates.